If you want to know about bolting a safe, you should know it isn’t a very complicated task. 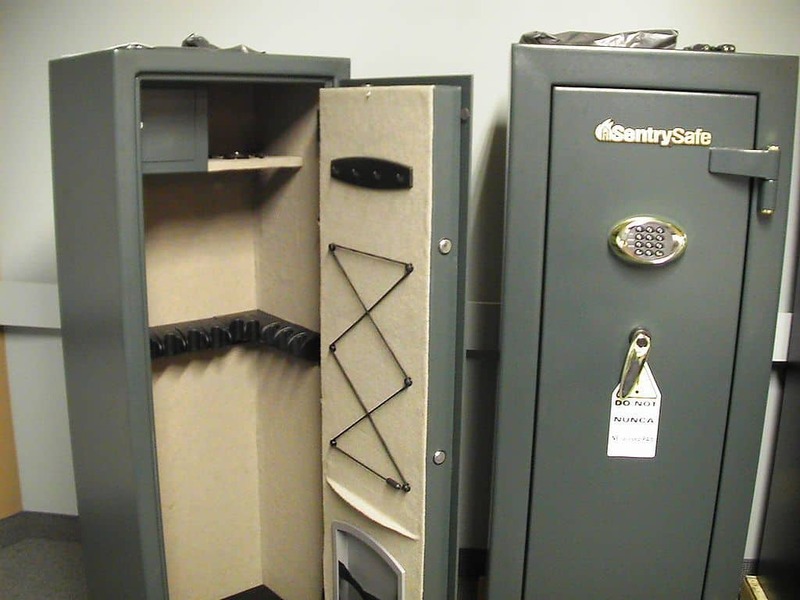 Gun safes are usually designed to be bolted down, so you won’t have a very hard time doing it. We are going to look at some basic concepts that will guide you through this process. We are going to assume you have read the instructions that come with your particular safe. After all, these are the best sources of information on bolting down a safe. If you don’t have the manuals handy, that’s okay. Overall, the concepts are not difficult, and pretty soon your safe will be bolted down and secure! ​You may want to know how to bolt a safe to the floor, or maybe to the wall. Or you may have other questions about mounting safes. We’ll go over many popular questions and methods so you can be sure your safe is properly bolted down. ​One of the most common questions about bolting down gun safes involves types of floors. So first we’ll look at how to bolt down a safe to a wood floor and then to a concrete floor. Neither is especially difficult, and you’ll be finished in no time flat! The main differences in floor mounting involve the types of fasteners and tools you’ll need to use. Often, a safe manufacturer will sell a mounting kit for the floor involved. You’ll just need to make sure you have the correct drill and drill bits to get the job done. When you are securing a safe to a floor, you’ll need to make sure the floor can handle the weight of the safe. If unsure, consult with a building contractor or safe installer. After all, it wouldn’t be good if your safe literally broke through the floor! To ensure safety and theft prevention, gun owners like to attach their safes to the floor. Regardless whether or not you are working with concrete or wooden flooring, there are a few common tips to use when bolting a safe to the floor. To get started, you’ll need a couple simple tools like a marker and measuring tape, and maybe a stud finder. Getting a safe bolted to the floor won’t do you any good if you don’t position it properly. On wooden floors, you may be able to attach the safe to floor beams if they are large enough or close enough together. A tape measure and stud finder will help you locate these beams. Mark an outline of your safe on the floor where you plan to install it. Using your marker, mark holes on the floor from inside the safe where mounting holes are. After you do that, and you verify what you are going to be drilling into, you’ll be ready to start drilling! ​To do this, you’ll need special tools, like a drill strong enough for the job, and maybe an impact hammer depending on the fasteners you are using. You’ll also need a special concrete rated drill bit, so you can actually drill the mounting holes. Some manufacturers will sell complete floor bolting kits. If you can get one that works for your safe, then you are halfway there. Otherwise, you’ll need to check with your safe manufacturer for recommended bolt size, and acquire the right hardware and drill bits to use in mounting the safe. Most floors can be drilled into with a regular drill and concrete drill bit. Some may require an impact hammer if the hole to be drilled is large enough, so you’ll want to make sure what you need ahead of time. Once you’ve chosen the tool needed, and have identified where to drill, you can start drilling. Make sure ​you also have the best safe for the​ house so you won't encounter any more problems later on. The most common way of bolting down a safe to a concrete floor is to use an expanding anchor bolt. These bolts expand tightly in the hole, making for a very tight, snug fit. You only need common hand tools to install expanding anchor bolts, making this a very easy job. ​When you want to secure your gun safe (or really any safe) to a wooden floor, there are a couple different approaches, just like when opting to hand-carry a gun. If you have a crawlspace, you’ll might consider just drilling through the floor and using large nuts and washers. Or you might be able to fasten a safe to floor joists with lag screws. If you are going to try and mount to floor joists, you’ll need to find them and determine their spacing with a stud finder. Next you’ll have to see if the hole spacing in your safe allows you to mount to at least two joists. You may need to bolt your safe to a wider sheet of steel first, and then bolt the steel to your joists. The tools are fairly straightforward, with the hardest part being locating the mounting points and simply drilling the holes. Most any decent drill with do the job, and the proper bits are cheap and easy to get. You’ll need basic hand tools to attach the bolts to ​ensure the safety of all your guns and ammo, ​but that’s about it. ​Are you trying to figure out how to anchor a gun safe to a wall? This isn’t as tricky as it sounds. In fact, it is much like floor mounting, inasmuch as you mostly have to figure out where you’ll be mounting the safe, and identifying the anchor points, similar to the look of a​ good rifle and gun storage cabinet on the market. As before, identify the studs in the wall where you will be attaching screws. It is not advisable to mount directly to drywall, as the safe could be torn away from the wall with little effort. You should also avoid any rooms or walls with moisture such as the air conditioner or the bathroom as it can impact the gun safe itself. Instead, you must mount to wall studs, making sure not to hit any electrical wiring or plumbing. Once you’ve figured out where to drill, then you can fasten down your safe with the appropriate screws or lag bolts. You may want to fasten your safe to both the floor and wall for maximum security. Of course you can do one or the other, but why not both if you can? Are you trying to figure install a safe upstairs? Well, you aren’t alone. Getting a safe upstairs can be a problem in and of itself, and then you have to concern yourself with making sure your floor can support the weight, and then bolting it down. Fortunately, this is also a simple matter. Most floors can handle the weight of many common heavy safes. With a heavy enough safe, you might consider just fastening it to a piece of wide sheet metal that can’t fit through doors and call it good. Assuming your floors are structurally sound, you can also follow the same instructions for securing a safe to a floor. Or you could attach it to a wall. You should consult with a skilled safe installer or building contractor before proceeding though, just to make sure everything will work out for you. A lightweight safe will be easier to move and install, but also easier to steal. 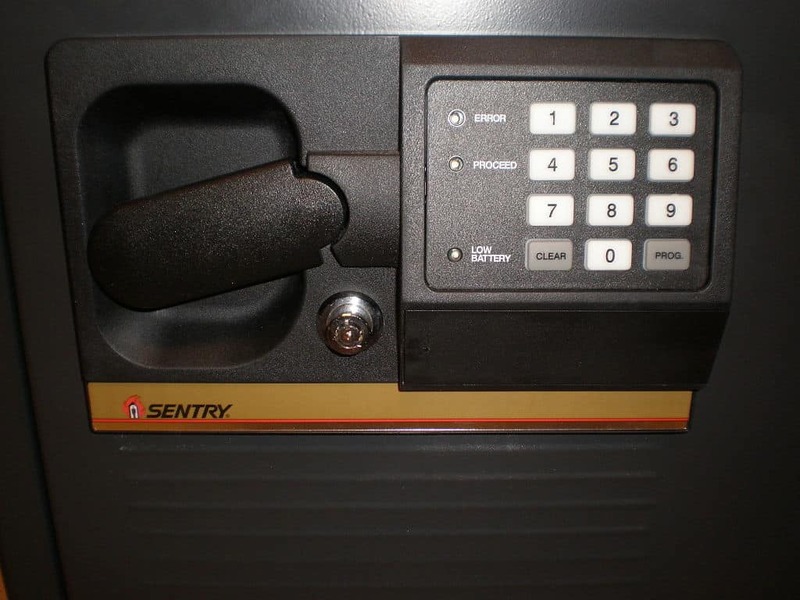 A safe with a fingerprint scanner is good for protection, but not all safes have it. So you probably want to go ahead with a heavy safe, and fasten it down with any of the several proven methods we’ve examined. Or you could gamble on crooks not coming prepared to haul off a monster safe, but why chance it? Ensuring the safety of your guns and valuables is vital. 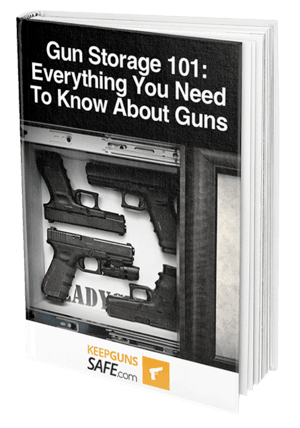 Find out the best gun safe for you and your needs through our ​ guide. ​Floor safes are very useful safes because they can be so easily hidden. However, installing them requires a bit more work, and may be best left to a professional. You will have to cut and dig out a concrete floor, or modify an existing wooden floor. Learning how to bolt down a safe to concrete floor may be the easiest option in terms of the type of flooring to bolt to. After you’ve determined the size of the hole you need to cement in your safe, simply cut and dig your hole, then place and cement your safe. New construction is even easier, as the safe can be installed with the floor. In a wooden floor, you’ll have to cut a space for the safe. Then build a wooden framework to support the safe and whatever you use to permanently secure it, like cement. That way, it won't easily be moved and will be safe for the children. You could also use an commercial grade epoxy to literally glue your safe into place. ​When you are ready to begin bolting, the work itself isn’t hard. It mostly requires careful use of common hand and power tools and attention to safety and detail. Often you can get the same people who sold you your safe to install it for you. 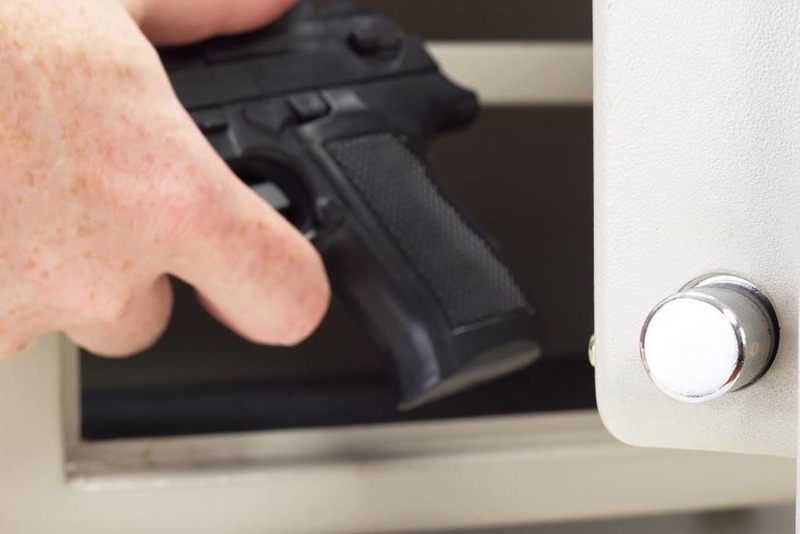 Once you’ve selected and bolted down your safe, then you can rest secure, knowing that you’ve taken extensive steps to protect your firearms and other valuables from unauthorized access and theft. The hardest part may be in selecting the safe itself! Either way, as you can now see, securing your safe is not a daunting task, and should only take a little bit of your time in most cases. Good luck!